← An open letter to Congress: Fix the roof! A few weeks ago, I was contacted by a May descendant who will be visiting northeast Ohio in October to do some family history research. Catherine Renschler, who is also the Executive Director of the Adams County Historical Society, located in Hastings, Nebraska, will be in the area to locate two May family homesteads in Portage County. 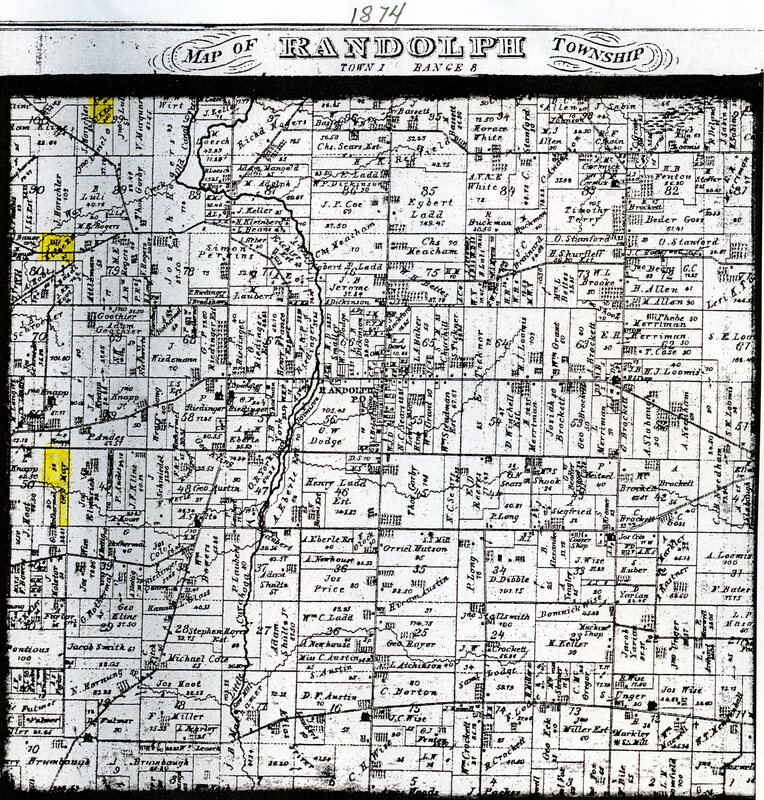 Attached is a scan of the 1874 plat map of Randolph township. The top two farms marked in yellow were owned by my ancestor, John Kline (1820-1855). In 1874 they were still owned by his estate. The bottom farm marked in yellow was owned by George May. I think this may have been my ancestor George May (1796-18900. I plan to research this land at the Portage County courthouse. I hope to locate these farms when I visit. You may post the scan at Knapp Notes if you want. It may be of interest to other family members. I forwarded Catherine’s email to Uncle Gary Knapp so we can make plans to meet and help her locate and photograph the two properties. If anyone else is interested in accompanying us or lending a hand, please contact Gary or I via Knapp Notes. This entry was posted in Family History, Kline/Cline/Klein, Local History, Maps, May. Bookmark the permalink. 5 Responses to Anyone know the location of May/Kline homesteads? Ann, After looking at the old maps, the farm of George May on Alexander rd. is still there. We made alfalfa hay on that farm for many years 1960’s to about 1970. The house is still there but it has been extensively re-modeled. There is also a large pond on the farm, the barn has been gone for years. Ann, I have located a J.F. Kline on the 1874 map of Randolph, lot 49, 40 acres on Alexander rd. To the cousins who are looking for the May and Kline ancestral homes. I was grew up in Randolph b.1949. I looked at the 1874 plat and George May’s farm, I checked the plat from 1857 and George lived there back then, with the boundary of the farm appearing to be the same. John May who died a couple of years ago at about the age of 87 lived on Conley rd, with Conely rd. being the boundary with Randolph on the east and Suffield on the west. On the 1874 map it is listed as being owned by M.Gless, the farm had about 30 acres on the Randolph side of the road and about 30 acres on the Suffield side of the road. As I recall by word of mouth the original barn on the farm burned down about 1944 and was replaced with a fine big barn that is there today. I checked the 1924 map and it indicated the farm was owned by a “Farnbaugh”. Also on the 1900 and 1924 map a Peter Kline owned a large farm that was located on the corner of Trares road and Rt. 43 in Suffield, the map indicates it was 91 acres. There’s a J.J. May on the 1900 map, had 73 acres on lot 9 near Congress lake road. 1900 Randolph map; G.A. Kline lots 29 and 39, 76 acres it was on Shaffer rd. and down the road from him was H.P. Kline on the corner of Shaffer and Hartville rds. 61 acres. There was an E. Kline, 25 acres on Eberle rd. Also on the 1900 map John D. Kline lived in what was the original house on the Joseph Schroeder farm on Schroeder rd. All I could find of the house about 15 years ago was the foundation. At some point I do know that John D. Kline moved to a farm on Hartville rd. on the creek near the corner of Eberle rd. The house has been gone for at least 15 years but the last time I was up there the barn was still standing. Hope I helped you a little. Any questions, feel free to ask. Once again, thanks for sharing all of this great information! I am sure Catherine will find it helpful when she visits the area next month. If you or anyone else out there has additional information to share, please drop me a line at Knapp Notes or comment on the blog. Best wishes and happy ancestor hunting to all!